1947. Performance artist Laurie Anderson born in Chicago, Illinois. 1983. DJ Kenny Everett, is acting as master of ceremonies for the Conservative Party Youth event at Wembley Conference Centre. Unfortunately, he gets carried away and tells his audience, “Let’s bomb Russia!” and “Let’s kick Michael Foot’s sticks away!” He also jokes that he’d had tea with Prime Minister Margaret Thatcher and said to her, “Maggie, you’re rolling that joint all wrong”. Everett isn’t asked back. 1978. A temporary High Court injunction is obtained in London, stopping David Gates and two former members of Bread from touring the U.K. as David Gates And Bread. The injunction follows a writ issued by James A. Griffin (another former member) and Bread Enterprises Inc., who own the registered trade mark on the band’s name. A hearing is set for June 7th. 1989. Bill Wyman and Mandy Smith have their wedding blessed at the Church Of St. John The Evangelist in London’s Hyde Park Crescent. In marked contrast to their wedding on June 2nd, 170 guests attend the ceremony which is followed by a reception for 400 at the Grosvenor House Hotel. 1971. Disco (ZDF, West Germany) 4. Bourbon Family – “Acapulco gold”; Joe Dolan – “Sometimes a man just has to cry”; Clodagh Rodgers – “Jack in the box”; Dave Dee – “Wedding bells”; T.Rex – “Hot love”; Samantha Jones – “Sweet Inspiration”; Bill + Buster – “Hold on to what you’ve got”; Thomas Hock – “; The Rolling Stones – “Brown sugar”; Ricky Shayne – “Ginny come to me”. Here’s a ten minute section of the show featuring Dave Dee, T. Rex, Samatha Jones and Bill + Buster. 1968. Bob Dylan‘s father, Abraham Zimmerman, dies from a heart attack. Dylan flies back to Hibbing the following day. The funeral is held on June 7th and Bob stays with his mother until June 11th, when he flies back to New York. Sara, his wife, is expecting a baby and Bob wants to be at the birth. On Tuesday I visited Fondation Cartier pour l’art contemporain in Paris and Patti Smith‘s exhibition entitled, “Land 250”. The first thing that strikes you about Fondation Cartier is the building itself, a glass box held together by a steel exoskeleton set in a garden in the middle of the city. Walking into the building you can’t help but be awed by the scale of the open exhibition space on the ground floor. It’s an open, bright space but that wasn’t where Patti’s show was hanging. For that, you walk down into the basement. The large space seems smaller and more intimate with subdued lighting and sofas sitting on rugs in the middle of the room. Initially the senses are bombarded. Video projections flicker on the walls and even on suspended screens around the homely seating. 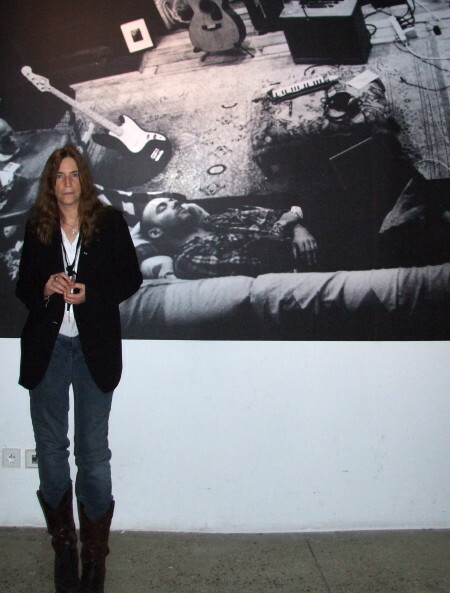 There are some stunning huge photographs along with Patti’s drawings and polaroids around the walls. It’s an assault on the senses that pulls you in and seduces you. This is, quite simply, amazing. Throughout the main room (described as “At Home”) are a number of display cases. One features an original visiting card of Arthur Rimbaud’s as well as a first edition of “A Season In Hell”. Sharing the space with these relics is another modern one, Patti’s t-shirt worn for many live performances over the last 30 years. I was totally mesmerized by this room, the quality of the work, the intimacy of the videos and the personal items. There’s too much to take in. This is definitely an exhibition that would benefit from repeat visits. The only trouble seemed to be that it was too comfortable. I saw one visitor dozing on a sofa! Along with the main exhibition space are two other rooms. One is the Rene Daumal Room. The walls are white, covered with the comments and scribblings of the fans who’ve attended since the exhibition opened on March 28th, a century and 12 days since Daumal’s birth. On May 21st, to commemorate the day of his death, the walls were covered with sheets of white gauze. As well as the constantly running video, are a number of drawings and photographs. In the room are a prison bed, an ethiopian blanket and a offering bowl of rice. I have to say, this room didn’t work as well for me as the others. The third room is the Coral Sea Room. In the centre of this darkened space is a large black gazebo with black gauze walls. A video projection plays on one wall and also on a screen stretched arcoss a table in the middle of the room. A bench on either side allows people to sit and fully absorb the atmosphere. Patti says in her commentary that she likes to come and sit here and think of Robert Mapplethorpe. I can see why, it’s a quiet restful meditative space. 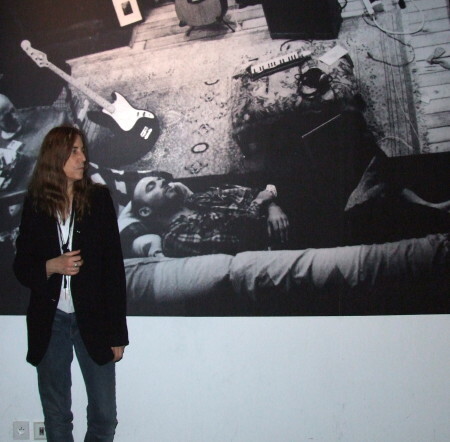 The walls around this are lined with photographs by both Patti and Robert. One of Patti’s is a polaroid taken of the Last Supper which salutes religion and Warhol at the same time. Two other religious relics add to the atmosphere – a chalice carved from driftwood and the slippers worn by Pope Benedict XV who made Joan of Arc a saint. I wanted to take a break and went outside to try and photograph the building and when I walked back inside was stunned to see that Patti herself was there. She was relaxed and charming, happily signing autographs for anyone who asked. While she was there she explained many of the items exhibited and even the Rene Daumal Room to those in it at the time. She was followed by a TV crew but stayed long after they left, disappearing into the offices above the gallery spaces. The exhibition runs until June 22nd. If you’re in Paris, check it out. I was told that Patti was staying in an hotel just around the corner so you may be lucky and catch her on one of her visits. I flew back yesterday afternoon and stopped at a shopping mall for dinner on my way home. It was full of screaming kids and more than a thousand people. Needless to say I had to see what was happening. It was a personal appearance by the scariest of the Spice Girls, Mel B, at the Debenham’s store. She wasn’t there to plug a new release but to launch a new range of Ultimo bras! Here she is with the bra’s designer, Michelle Mone. The birthday cake was for Mel, albeit a few days out!